The Red Army’s T-34 battle tank helped upset Hitler’s designs for conquest on the Eastern Front. The “them” he was referring to were the famed Soviet Red Army T-34 battle tanks that had come as such a nasty surprise to the Nazis in the summer of 1941 and then went on to become a major reason for the panzers being halted at the gates of Moscow. There were also the shocking production numbers to consider. Hitler lamented his decision to invade the vast Soviet Union, but it was too late to reverse his course. During 1939-1945, the Third Reich had produced 19,938 tanks. Even with the best of Minister of Armaments and War Production Albert Speer’s most streamlined methods, the Soviets still outnumbered them, with 53,552 T-34 tanks alone sent from factories to the battlefields of Eastern Europe. In addition, the Germans had an obsession with more and more unique models, while the Soviets relied mainly on the T-34. Thus, if one of their mobile units broke down, the Nazis might have difficulty in finding spare parts, while the tankers of the Red Army could literally scour any battlefield and find parts for their damaged T-34s. In the end, this was a clear advantage over their “more mechanized” foes. In Speer’s 1970 memoirs, Inside the Third Reich, there appears this interesting passage: “Very often, directly after one of these conferences, Hitler would lecture his military advisers on the technical knowledge he had just acquired. He loved to present such pieces of information with a casual air, as if the knowledge were his own. “When the Russian T-34 appeared, Hitler was triumphant, for he could then point out that he had earlier demanded the kind of long-barreled gun it had. Even before my appointment as Minister of Armaments, I had heard Hitler in the Chancellery garden, after a demonstration of the Panzer IV, inveighing against the obstinacy of the Army Ordnance Office which had turned down his idea for increasing the velocity of the missile by lengthening the barrel. “The Ordnance Office at the time presented counterarguments: The long barrel would overload the tank in front, since it was not built with such a gun in view. If so major a change were introduced, the whole design would be thrown out of balance. In July 1941, the Germans first encountered the T-34 and discovered to their horror that its gun could knock out their own armored fighting vehicles at longer ranges than their own guns could effectively reply. The T-34 combined punch with mobility in a single superb package. Note Hughes and Mann, “The T-34 had firepower, armor protection and mobility far superior to other tanks then in service. In particular, its broad tracks and low ground-bearing pressure meant it could keep going on soft ground where German tanks often became bogged down—crucial for warfare on the Eastern Front…. Arguably the finest all-around battle tank of World War II, the Soviet T-34 mounted at 76.2mm main gun and reached the Eastern Front in large numbers. The 76.2mm gun on the T-34 had a real hitting power to it by the armament standards of the day, and its radical new sloping armor gave it unusual protection. Its superior diesel engine and Christie suspension system provided superb cross-country performance as well. Later, an 85mm gun and even heavier armor were added to the same basic chassis, which was in itself a remarkable engineering feat. The T-34 was, quite literally, the main weapon of war that blunted the formerly invincible Nazi war strategy. Professor John Erickson, author of The Road to Stalingrad and The Road to Berlin, stated, “For the Russians, the T-34 was certainly a war-winning weapon. It was superb on the battlefield … but it represents so much more. It represents the fact they won a stupendous victory over fascism. Designed and prototyped during 1939-1940 as Nazi Germany’s panzers were overrunning the plains of Poland and then Northwestern Europe, about 1,200 T-34s were ready for use on June 22, 1941, when Hitler invaded the Soviet Union in Operation Barbarossa. The majority of these early T-34s were manufactured at “Tankograd,” the popular name for Chelyabinsk, east of the Ural Mountains in Soviet Asia, where two factories from Leningrad and Kharkov had been evacuated to begin work anew. 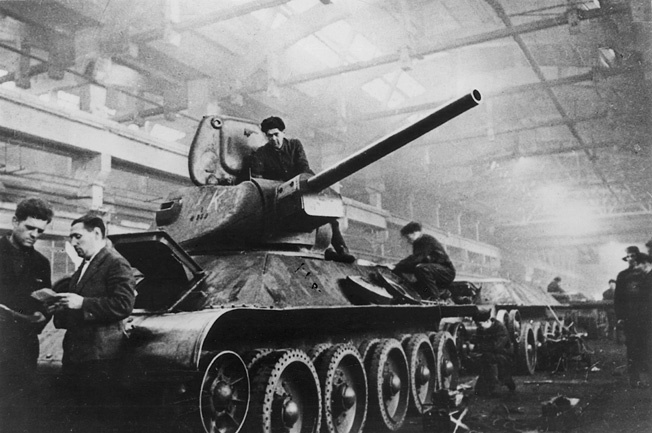 Production of the T-34 continued after World War II. The construction of the tank was a relatively simple process, and it had proven itself during wartime to be an effective combination of numerous design features. The SU-85 and SU-100 assault guns were later variants of the original T-34 design. The tank had a V-2-34 V-12 cylinder, liquid-cooled diesel engine at the rear of the vehicle with a capacity of 38,880 cubic centimeters. Its maximum output was 500 hp at 1,800 rpm. It had a dry multiplate clutch and 5F1R gearbox with front-sprocket drive and clutch-and-brake steering. The tank had mechanical brakes and a track width of 500mm, a wheel size of 825mm, 12/24 volt/electrics, plus a 450- (later 650-) liter fuel capacity. Its armor was 65 to 100mm thick, and it sat a crew of four. The initial design had the 76.2mm main gun, and from late 1943 (following the Battle of Kursk that the Red Army won over the Germans in the greatest tank encounter to date) the T-34/85 packed the heavier 85mm gun in the main turret. The overall length of the T-34 was 5,920mm excluding the gun barrel. The width was 2,950mm, the height was 2,600mm, and the weight was 26,500 kilograms. As noted by Col. Gen. Alfred Jodl, Field Marshal Wilhelm Keitel’s deputy in the German Armed Forces High Command structure, Hitler was quick to respond to the challenge that the T-34 presented to the Reich’s outdated panzer arm. “He created the Ministry for Weapons and Munitions under [Fritz] Todt [later Speer], leaving only the building of airplanes and ships with the Air Force and the Navy. Workers make final adjustments to the turret and chassis of a new T-34 medium tank. Many of these stalwart fighting vehicles were driven straight from the factory into combat. Thus, the Red Army’s overwhelming success with the T-34 dramatically influenced the armored design of its major opponents on the battlefield for the rest of the war. This development, moreover, was also felt by the Western Allies in northwestern Europe during 1944-1945, when the new German panzers fought there. Initially, the Soviet Union had been behind both the West and the Reich in the development of armor, but this changed as Soviet dictator Josef Stalin and his Red Army High Command (later Stavka) evaluated the lessons learned from fighting the Nationalists during the Spanish Civil War of 1936-1939 and the Finns in the disastrous Russo-Finnish War of 1939-1940. By 1941, they had caught and surpassed both the Germans and their future Allies with the magnificent T-34. Hitler’s improvements preceded the Battle of Kursk, which the Nazis were determined to win, especially after their catastrophic loss at Stalingrad earlier in 1943. In his 1970 memoir, Khrushchev Remembers, former Soviet Premier Nikita S. Khrushchev wrote of Kursk, “The enemy, too, was confident of victory. Later I saw an order we captured from a demolished German armored unit. It contained a message addressed to the German troops which went something like this: ‘You are now waging an offensive with tanks far superior to the Russian T-34s. Until now the T-34 has been the best tank in the world, better even than our own, but now you have our new Tiger tanks. There is no equal to them. With such a weapon you warriors of the German Army cannot fail to crush the enemy.’ Their new tanks were very menacing indeed, but our troops learned quickly how to deal with them. At Kursk, we won a battle which tipped the balance of the war in our favor.… It was decisive in determining the defeat of Hitlerite Germany.…” The T-34 had played the major role once again. Early T-34s enjoyed a high level of craftsmanship in their manufacture. The T-34’s design bureau head was Mikhail Koshkin, and his deputy was Alexsandr Morozov, who was in charge of building the power train. The suspension team was led by Nikolai Kucherenko and P. Vashiev, while the armor layout of the new tank was the responsibility of M. Tarshinov. The first wooden model of the prototype, designated the A-20, was presented to the Defense Council of the Soviet of People’s Commissars in Moscow in May 1938. The initial A-20 design led to its successor, the A-32, which was an up-armored version, which led in turn to the T-34. The final tank’s secondary armament was a 7.62mm co-axial Degtaryev DT machine gun in the hull, fired by a gunner who sat next to the driver. An advancing T-34 tank stirs up a cloud of summertime dust as Red Army soldiers crouch behind it. The Soviet armed forces mounted a devastating offensive in 1944, which carried them to the gates of Berlin. Like the American Sherman tank, the T-34’s engine was mounted in the rear of the vehicle, and was flanked by cooling radiators on each side. The T-34’s road speed was an impressive 34 mph, and its cross-country speed was between 10-15.62mph depending on the grade and roughness of the ground being covered. The tank’s operational range was 290 miles, and the use of diesel fuel reduced the risk of fire. With its transmission located in the tank’s rear, the crew compartment was more spacious, since the drive train did not pass through it. The primary gun’s 76.2mm ammunition was stored on the walls of the T-34, while more rounds were also found in bins sunk into the hull flooring, as well as in ammo racks on the sides of the turret. The rear of the turret also contained the drums for the vehicle’s secondary armament of the vehicle, the DT 7.62mm machine gun. The vast numbers of T-34s produced went to the front with the crews that would use them via the network of railroad lines that also helped Mother Russia win the war. Thus, the Red Army was able to concentrate huge numbers of tanks at battles like Stalingrad to turn the tide in their favor. 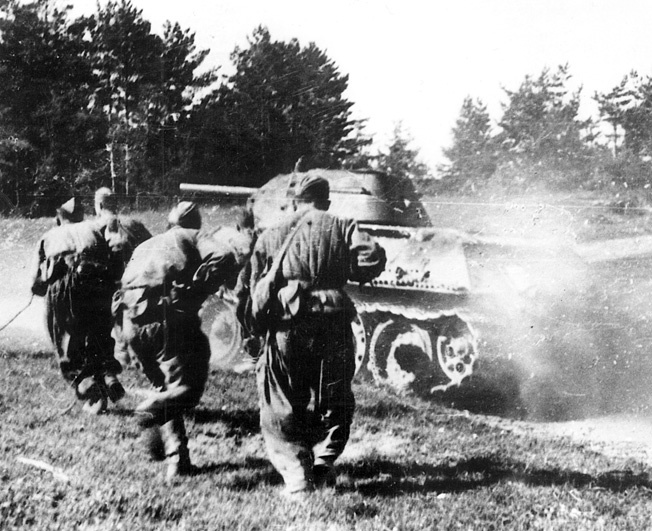 In combat, in addition to fighting Nazi armor one-on-one, the T-34s also served as infantry armored personnel carriers, since the Red Army had no real APCs as such on the front lines. The tanks left the factory with a dark green-painted finish and were later camouflaged, in some cases with a smattering of white paint. 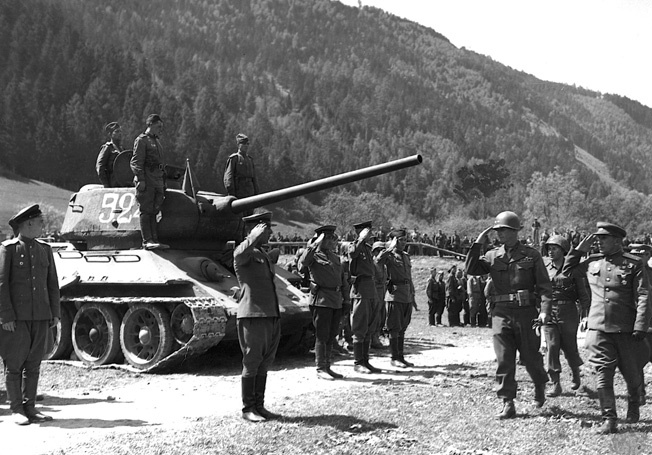 Communist Party political officers (the commissars that Hitler had ordered shot on sight when captured) encouraged their men to paint patriotic slogans on the sides of the T-34s. A detachment of Red Army Guards snaps to attention as a group of visiting Americans passes. A T-34 tank squats with the Soviets on a parade ground after the end of hostilities. The T-34 was also shipped by rail across the Soviet Union via the Trans-Siberian Railway to smash the Japanese Kwantung Army in Mongolia in the late summer of 1945. Afterward, the tanks would fight the Americans in Korea during 1950-1953. They were also used by the Arab nations against the Israeli Defense Forces during the Six-Day War in June 1967 and again in the Yom Kippur War in 1973. Towson, Maryland, freelancer Blaine Taylor is the author of Mercedes-Benz Parade and Staff Cars of the Third Reich and the forthcoming Volkswagen Civil and Military Vehicles of the Third Reich and Apex of Glory: Mercedes and Daimler-Benz in the Third Reich, both to be published in 2004. Tags Adolf Hitler, Albert Speer, Alfred Jodl, Allies, American, anti-tank gun, armed forces, armored fighting vehicle, Asia, Battle of Kursk, Battle of Stalingrad, battle tank, battlefield, Berlin, Bosnia, Camouflage, Cata, CIA, civil war, Daimler-Benz, EAM, Eastern Europe, Eastern Front, Europe, Fascism, Features, Fritz Todt, German, Germany, Israel, Israeli Defense Force, Japan, Japanese, Joseph Stalin, Kharkov, Korea, Kwantung Army, lance, Lenin, leningrad, machine gun, Mary, memoir, Mercedes-Benz, military, Moscow, Nationalists, navy, Nazi, Nazi Germany, Operation Barbarossa, OSS, Panzer, PC, Pola, Poland, POW, Prussia, Red Army, Russia, Russo-finnish war, SAS, Sherman Tank, Six-Day War, Soviet Union, Spanish Civil War, Stalin, Stalingrad, Stavka, T-34 tank, Tanks, Tern, The Eastern Front, Third Reich, Thor, Tiger Tank, Tory, Troy, Union, Volkswagen, war strategy, weapons, WIN, World War I, Yom Kippur War, Yugoslavia. The T-34 was a good tank, though its reputation is far in excess of its actual effect on the battle field. In most ways the M4 and the T34 are nearly identical in on paper abilities, in the field the M4 tended to be more effective due to higher reliability and “soft” values making the crew more effective and more likely to survive if the vehicle was penetrated.